A shot of waves hitting the Sydney Heads from the lookout at Watsons Bay. This year, hundreds of photographers have submitted images for the competition. The theme being exploration of the traditional nature of a seascape photograph. The focus being on the Port Phillip Bay region, but this was not a strict requirement. Just before entering hospital last year, I was playing around on the internet and came across the Lens Mist Photography Competition held by the City of Kingston - it was free to enter by uploading onto a website and the theme was water. I thought, why not. And amazingly, I was selected as a finalist - the exhibition and awards will be announced on the 17th March, so I can't wait to find out. 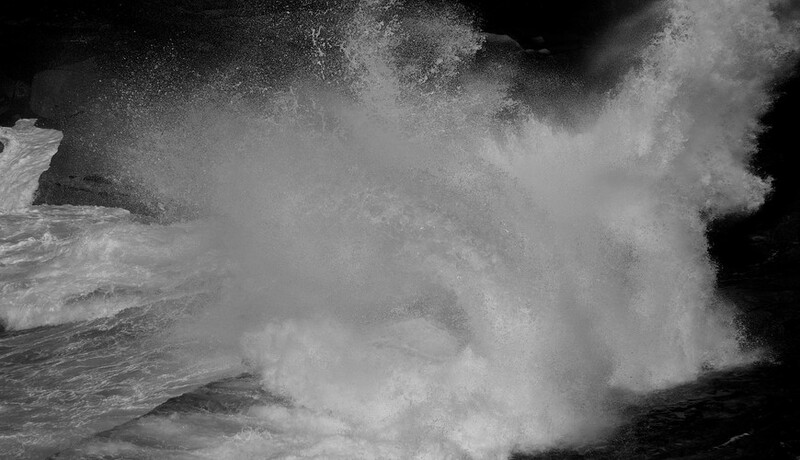 The image that I submitted was Waves Crashing 2 â€” a shot of waves hitting the Sydney Heads from the lookout at Watsons Bay. I only had a couple of minutes to snap the shot as my husband was eager to head back to the city before the crowds. It was taken during the day and converted to black / white with the contrast increased and vignette added. Our fingers are crossed for Michelle, winners are to be announced on the 17th of March with the 20 finalists on display during the Mordialloc by the Bay Fine Food, Wine and Music Festival. The winner receives a cash prize of $5,000. If you get a chance to go along, you can also vote for your faviourite shot (Michelle's) and help it secure the People's Choice Award of $2,000.